Donald L. Morrill Math & Science School’s Space to Grow redesign included, among other things, a multipurpose turf field, two half-court basketball courts, play equipment for students of all ages, edible Learning Gardens from The Kitchen Community and disconnected downspouts that feed water into rain gardens with native plants. In 2014, Morrill was chosen as one of the first schools to receive a $1.5 million schoolyard transformation from Space to Grow. 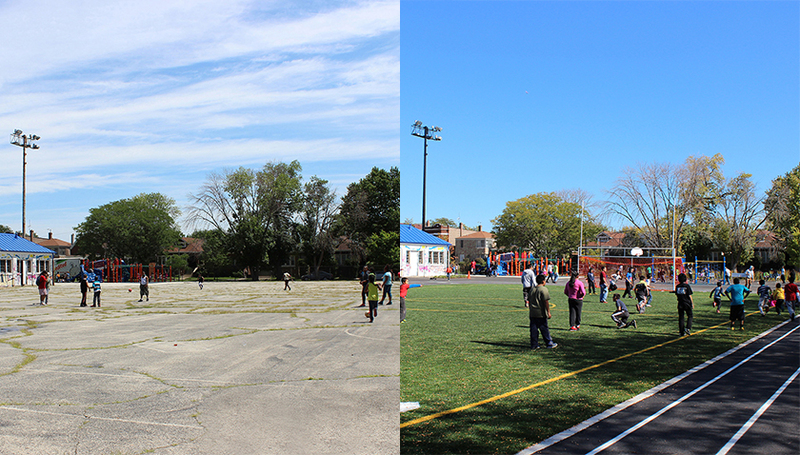 And now, almost two years later, the schoolyard is filled with kids playing basketball, students of all ages using the playground equipment, and the community milling around the rain gardens. “I love the schoolyard because it brings families together,” said local resident Terry Smith. “Sometimes people go to the garden to have a picnic—just watching the flowers … Everybody’s trying to keep it beautiful.” In addition to providing students a place to play and learn, the space addresses flooding through the use of green stormwater infrastructure.